Android developers who want to keep tabs on how their apps appear to Googles search engine got a couple of new tools on Friday. Targeting those who participate in its App Indexing initiative, Google updated its newly renamed Search Console (formerly known as Webmaster Tools) with new reports to provide insight on how its search engine views in-app content. The Search Analytics report provides detailed information on top queries and top app pages as well as traffic by country. It also has a comprehensive set of filters, allowing users to zero in on a specific query type or region or sort by clicks, impressions, click-through rates or positions. 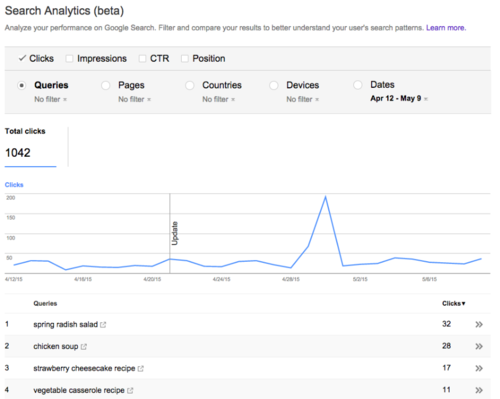 "Use the Search Analytics report to compare which app content you consider most important with the content that actually shows up in search and gets the most clicks," wrote Hillel Maoz, Google's engineering lead for the Search Console Team, and Webmaster Trends Analyst Mariya Moeva in a Friday blog post. "If they match, youre on the right track!" If there's a mismatch, developers may need to restructure their navigation or make the most important content easier to find, they added. A Crawl Errors report, meanwhile, will reveal the type and number of errors Google detects along the way. Also new Friday is an alpha version of the Fetch as Google tool for apps, to help developers confirm that an app URI works and see how Google renders it. It can also be useful for uncovering any content mismatch between the app's content and that on the Web page, Google said. Google announced recently that mobile search has now overtaken PC search in terms of volume in the United States, Japan and eight other countries, noted Greg Sterling, vice president of strategy and insights for the Local Search Association. "Thus mobile search has become a potentially important content and app discovery tool for developers," Sterling said. The new analytics offerings are in many ways a "carrot" designed to encourage app developers to adopt deep linking and make their in-app content more indexable, he added. Ultimately, though, Google itself is the one that benefits most of all, Sterling pointed out. "The more mobile search becomes a useful tool for content discovery, the more it will reinforce mobile search usage among smartphone owners," he said. "Over the long term, that benefits Google through traffic and increased demand for mobile search."